Purchase the Europiccola with Chrome Base and Receive 3 - 8 oz bags of coffee FREE! 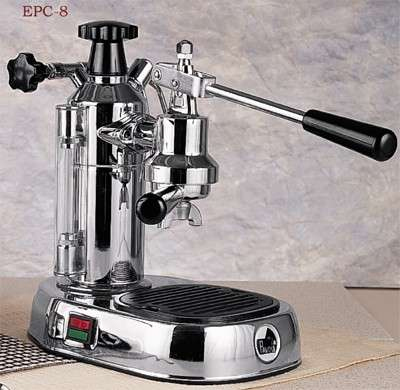 This hand crafted Italian made work of art is the perfect lever espresso machine for the espresso connoisseur. The Europiccola is an extremely well made machine with ample capacity. 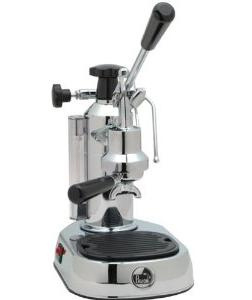 It uses piston lever technology to evenly pull water through the espresso. With a manual espresso machine you can pull much smoother shots than with a pump model. This machine has a milk frothing steam wand for lattes and cappuccinos. The La Pavoni Europiccola contains a large brass boiler and rugged stainless steel heating element. Comes with 2 - stainless steel coffee filter baskets and a demonstration video. Gift box included at no additional charge.